Join us for the 12th Montreal Summer Tango Fling! Come and experience our regular hangouts and meet our local dancers. Discover quite simply why Montreal is one the the best tango destinations in North America. The Summer Fling runs anywhere from a few days to a whole week. It is usually held on the September long weekend. This year's Fling begins on the Wednesday before Labour Day and continues until the next Tuesday. The Fling is not a festival nor is it a marathon in the conventional sense, but more like a celebration of all the regular milonga weekly milongas held in Montreal topped off with one all-night milonga held over the weekend. Locals and guests alike are encouraged to hit as many places as possible (on many days/nights there are multiple choices!) and to just go out, dance and have a fantastic time. It's a great way for Montrealers to get to know newer milongas and rediscover some of their older favourites and an absolutely splendid way for all of us locals to introduce our lovely clubs to our friends from out of town! MOST of the milonga details (addresses, times, etc) are posted on the side of this page and the whole list will be updated as more info comes in. For the moment though, all you really need to know for now) is that this year's Fling starts on Wednesday, August 29th and goes for a complete week. We'll milonga hop every day and evening and a super great time will be had by all! The basic idea is to go out, have a good time (and we certainly do!) while trying to hit as many of the local milongas as possible. The schedule is packed with milonga after milonga, however many members of the Montreal tango community also manage to find time to organise more . . . keep your ears open for news about cocktail parties, bar-b-q's and other fun stuff. THE MILONGA SCHEDULE can be found on the side bar of this page (if viewing on a computer) or if you are using a phone, just scroll down to bottom. Each year the Fling features an all-night milonga organised by Studio Tango Montreal, often in collaboration with another local tango space. The 2018 FLING ALL-NIGHT MILONGA will be on Saturday, September 1st and will be held at the Studio Tango Montréal/Tango Social Club location at 7755 boul. St-Laurent. The all-nighter features guest dj's, a bagel snack late night buffet, door prizes and other fun stuff. Tangueros and tangueras from all over the North East, return year after year, for this very popular event. Everyone adores this laid back, relaxed milonga which always features the very best music brought to us by the best dj's North America has to offer. A true celebration ''Montreal Style''. This is how the story goes . . . back in 2006, three of us were discussing over coffee, about how it seemed that most tango visitors only danced in Montreal during big festivals and often didn't have a chance to get to know the local scene . . . Proud as we are of our local milongas and of our fantastic community, we schemed and plotted, trying to find the best way to show out-of-towners how Montreal is such an incredibly great tango destination ALL OF THE TIME (and not just during the big festivals). et VOILÀ: The Montreal Summer Tango Fling came to be! That first year, we handed out cards at every fest we went to, trying to push and advertise our event as much as we could . . . . . and it worked: over 75 people came in from out of town for what we had thought was essentially nothing special. With just an online calendar of the regular milongas plus one all-nighter at ''The Studio''......... we wondered, ''was that really enough ?'' Well, the answer was an abounding yes. The charm of our local milongas mixed with the good vibes provided by our local milongueros/as turns out to be a spectacularly contagious recipe - and well, that first Fling was a hit! Now into our 12th year, our little non-event has become a much anticipated annual affair. Do you live in Montreal and have room to take in a guest dancer from out of town? Are you from out of town and need a sofa to bunk on? 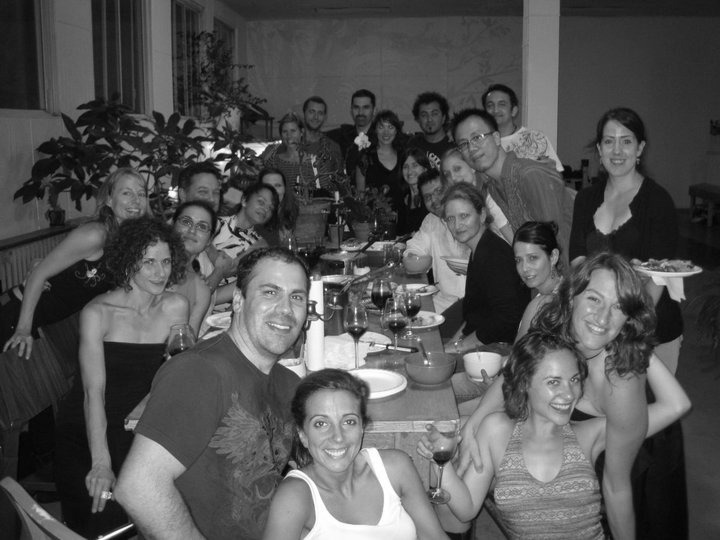 First established back in the late 80’s the Montreal Tango community has been growing steadily ever since. We are a very “sociable” tango community with hundreds of dancers frequenting our many local milongas some of which have been running for close to 20 years. Montreal has quite a few schools that teach exclusively argentine tango. Some hold 2 or 3 classes per night, 6-7 days per week taught by teachers with 10-15 or 20 years experience. Almost all the milongas you will go to during the Fling are held in local tango studios which transform their spaces into milongas one night each week. Montrealers like to go out, (in fact it is literally possible to dance tango every single night of the year in Montreal). Our tango community is a demanding one when it comes to the quality of our dance halls. “Atmosphere” is omni important here. All our milongas (big and small) have a “club feel” (nice lighting, candles, tables & chairs, bars *), great dance floors, DJ’s who know their tango music and excellent sound systems. * N.B: Every milonga in Montreal has a bar at which you can buy drinks (some sell alcohol) and at which you should tip the bar person (15% +) It is not cool to bring your own beverages and it is illegal to bring in your own alcoholic drinks. Last call for alcohol is at 3 am, but many milongas that stay open later will continue to sell non-alcoholic beverages until closing. Generally no food is sold, nor are any snacks provided unless otherwise mentioned. In Montreal anything goes fashion wise, but it should be noted that in general Montrealers tend to dress up a bit more than in some other cities. Think East coast urban mixed with a slightly European flair. Some will tend to dress up a bit more at certain milongas on certain evenings (some of the Friday, Saturday and Sunday places especially), but there is no dress code per se at any place. Montreal is well known for it's bitterly cold winters, however it should be noted that summer is darn hot and humid here! Unfortunately our clubs for the most part don't have really strong AC so it can be REALLY HOT at the milonga. Some of you fellows might want to bring an extra shirt to the milonga. The cabaceo is not used by everyone here. Many just go over and invite. In Montreal it is not uncommon for women to invite men, although perhaps not done frequently between complete strangers. Hint for people coming alone: Try and hang out near the bar or by the water cooler. In most milongas it is the best area of the room for mingling. The milongas are less crowded towards the beginning and ends of each evening. Arriving early when there are less people can often help facilitate mixing and meeting new people. Consult the Fling schedule for particular milonga times. Generally, if a club opens at 8:30 pm then the big crush will be between 9:45 pm and 12:00 am. At milongas which go to 3 am or later, expect it to be crowded starting more or less around 11 pm until after 1 am. 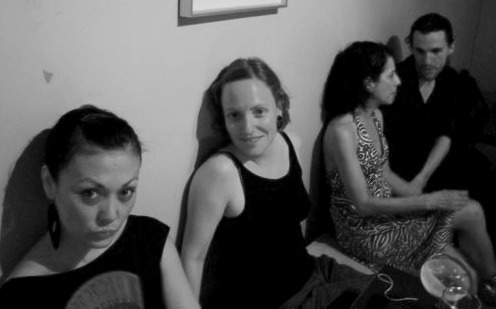 It is not uncommon for people to arrive at a Friday night milonga for example, around midnight. though some vary slightly the formula. At some places a set or two of salsas or swing might be played during the evening. There are no rules as to how many tandas you should dance with the same person. Some of the dancers who started years ago (like 15 to 20 years ago) prefer to dance only one tanda at a time with a person. So no need to feel insulted or rejected if a Montrealer says thank-you after the first tanda. On the other hand: No one will care much if you dance 3 tandas in a row with the same person. As far as the music goes, Montreal is a pretty traditional tango community and the music played is for the most part, generally from the late 30’s to early 50’s. Montreal’s tango roots are firmly established in the “salon style”. Most of the local teachers (the majority who have been teaching for over 10 years) were strongly influenced by the maestros who gave workshops here in the 90’s: Pepito, Esteban Moreno, Pablo Veron for example. And our local teachers have for the most part passed on variations of this style to their students. Meaning there aren’t really divided camps of close and open frame dancers here. Most of us tend to dance in a closer type frame or small V, and move fluidly between close and open during any given dance. Also, there isn’t really a division here as far as traditional and newer dance styles go, but common sense is expected on a crowded dance floor. Montreal's longest running weeknight milonga. Good music, great floor, full bar ;) relaxed vibe. Feel like doing a class before? Join Luis Lopez world famous Argentine Folklore master for a Chacarera class at 7:30 pm. No previous experience necessary. No partner needed either. 30$ includes free entry to the milonga. Montreal's most popular weekday afternoon milonga! •8 p.m. Open tango class with Andrea and Wolf: a fun step with variations for all levels. •9 p.m - 1 am. Milonga with live music performed by the Redwood Tango Trio from San Francisco. DJ Wolf will keep you dancing between sets. The east regular milongas (Air de Tango, etc) aren't happening this year - so the Studio will pick up the slack! 9:30 pm until 5:30 am. This is a traditional fling event. The one we wait for every year! The 2 adjoining rooms will be opened up - doubling the dance floor space. MONTANGO, , 5588A Sherbrooke W.
''CAFÉ DOMINGO MILONGA '', 1-6 p.m.
Argentine tango práctica. Entry: $5 (cash only). mix of traditional and alternative. Mini-empandas ($2 each or two for $3)! Air-conditioned! Intimate milonga with a casual vibe. 3 pm - 7 pm, 10$ * coffee included! Come to both Monday milongas and pay 15$ instead of 18$ !